Comment: I have a leak coming from under a small area of the baseboard in my kitchen on the lower level of my townhome. An inspection by a handyman revealed that water is apparently coming in behind the gutter on the second floor and coming down the wall and leaking into my kitchen. 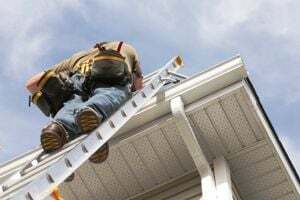 It looks like the gutter can be adjusted or repaired but I need an expert to inspect it to say for sure. Comment: I currently have gutters that need to be replaced and am looking to get some estimates. Comment: We have gutters, but need new seamless ones to divert water. Woodstock Gutter Cleaning & Repair Services are rated 4.71 out of 5 based on 1,894 reviews of 34 pros. Not Looking for Gutters Contractors in Woodstock, GA?